I don’t always get to share more illustrative diagrams that explain things, but that’s what we have today from the Economist. It illustrated the concept of a gene drive by which a gene modified in one chromosome then modifies the remaining chromosome to insert itself there. Consequently it stands an almost 100% chance of being passed onto the subsequent generation. Naturally this means great things for removing, say, mosquito-born diseases from populations as the gene drives can be used to ultimately eliminate the population. But of course, should we be doing this? Regardless, we have a graphic from the Economist. It makes nice use of a small mosquito icon to show how engineered mosquitos can take over the population from wild-type. The graphic does a nice job showing the generational effect with the light blue wild-type disappearing. 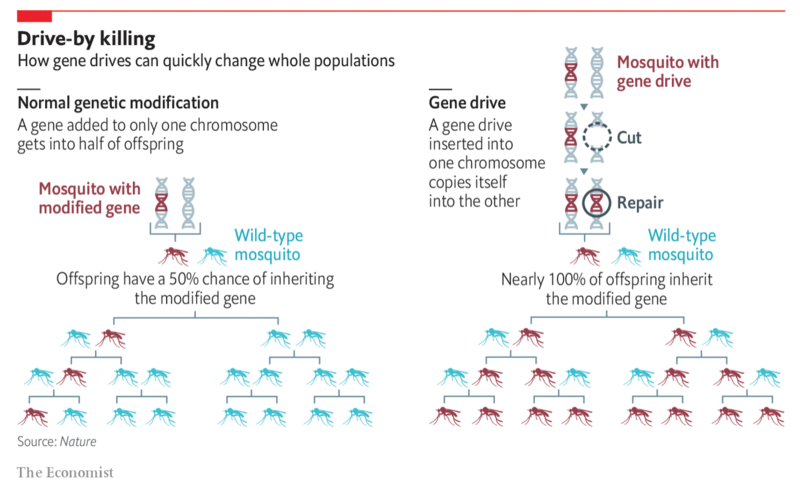 But I wonder if more could not be said about the actual gene drive itself. Of course, it could be that they simplified the process substantially to make it accessible to the audience. Credit for the piece goes the Economist graphics department.